The lobby of the Miami Beach Edition Hotel is sleek. Glossy white meets gold as light filters in through giant windows and glints across glass surfaces and smooth leather. Giant green plants shoot up towards the high ceiling where they hover, surveying the space in silence. Victor Calderone walks towards us from the elevator bank. We notice him coming from afar, dressed head-to-toe in black – in stark contrast to the swirl of colordrenched fashionistas milling about the lobby – and smile because our own black jeans and top match the techno titan’s. DJ Mag USA and DJ-producer Victor Calderone are an obvious pair of New Yorkers in the midst of hotelier Ian Schrager’s Shangri-La. There is a pair of seats by the bar, tucked away from foot-traffic, and we settle into them. Victor is in town to play the Friday night underground party thrown weekly by local promotion group LinkMiamiRebels at South Beach club TRADE. And while every techno party put together by that crew boasts a swoonworthy name – from Nicole Moudaber to Adam Beyer – tonight is special. 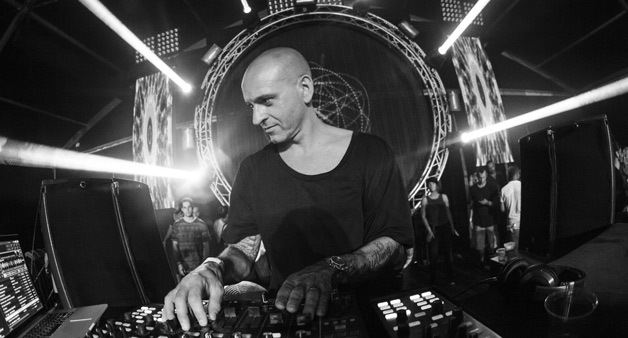 Tonight, life comes full circle for Victor Calderone. He smiles in disbelief as the idea dawns on him, “I had a residency at a South Beach club called Liquid for three years, starting in 1996. Liquid has now become TRADE, where I’m playing tonight.” He hasn’t set foot in that room since his old residency. Same space, different name. 2016 marks exactly 20 years since Victor took his techno DJing career to the next level, right here in Miami. The Brooklyn native has made a name for himself on the world stage as an artist who mastered the art of adaptation; he is as lauded in the techno underground as he is in the pop music mainstream. That agility, combined with tremendous talent, is what led him to world renown. From illustrious DJ residencies in NYC over the decades and a massive following as a straight DJ in the gay club circuit, to the more recent launching of his MATTER+ concept brand, to his impressive collection of remixes for pop royalty like Madonna, Sting and Beyoncé – produced at their personal request – Victor has found himself straddling disparate corners of the music kingdom. Such a feat is unsurprising though, once you understand his roots. “I grew up in a home where there was always music playing. My brother was a DJ. That’s actually how I got into it – back when it was Kraftwerk and Donna Summer, the whole disco era. You know, it was the ‘80s,” Victor smiles, recounting how his older brother, Cesare, took him to his first nightclub. At The Funhouse, the DJ booth was situated inside the gaping mouth of a giant clown’s face that had two huge discoballs for eyes. “And I was the kid who stood in front of that clown mouth all night while Jellybean played. There were moments when I’d ask him what he was playing and he’d write the song name on a piece of paper and pass it down to me,” Victor remembers, shaking his head with a smile. “Who would ever imagine that years later, John ‘Jellybean’ Benitez would DJ my own wedding?” He grins as another piece of the story comes full circle: The place where, as an adult, Victor finally met Jellybean and formed a friendship, was Liquid – the old club that is now TRADE, where Victor will play in just a few hours. He cites Jellybean as one of his main inspirations for DJing, in addition to his brother Cesare, who passed away. Victor’s love for his late brother is evident as he speaks. Loss remains painful despite the passage of time, but those we love live on through our own lives. We remind Victor that he does Cesare a great honor by carrying on the DJing tradition. He has been in the game longer than most DJs, despite the death and birth of genres and clubs, friends and family. We reminisce along with him, having been raised ourselves in a similar area of Queens, Brooklyn’s sister borough: Old Italian men with tassel loafers pacing bocce ball courts; the best cannolis this side of the Atlantic; bagels and lox better than any bar mitzvah spread. Bensonhurst’s cultural fabric has changed now, in the way that New York City always does – its neighborhood factions undulate from one immigrant population to the next in waves that wash over the footprints of prior occupants, leaving them covered in a new layer of language and traditions. Bensonhurst now brims with an Asian flavor; less marinara, more soy. And these days, Victor lives in DUMBO, a fashionable area of Brooklyn dominated by gentrified warehouses, gourmet markets, tech startups and a restless stroller mafia. He moved into the DUMBO neighborhood in 1998, just after marrying his wife, Athena. At the time, DUMBO was still something of a desolate outpost, full of looming loft buildings staring blankly at the glittering lights of Manhattan across the East River. But like his ear for seeking out the right tracks and trends at just the right time, Victor’s eye for real estate is spot on. “We’re serial movers,” he quips, explaining what appears to be a solid knack for flipping apartments. His wife is a successful interior designer with an eye for style, and together the pair seem to fuse their creative urges. That’s something many couples only dream of; Victor and Athena live it. He smiles when he talks about this subject in the same way that he smiles when he talks about music. And when Victor Calderone is DJing, his passion seeps through the beats. After all, we’ve felt it firsthand, at many an earlynaughties club night. He’s the guy who brought techno into our own lives. When we arrive at TRADE a few hours later, the party is in full swing. The room boasts a thick, warm sound system that pushes basslines up from the floor, through the souls of your feet and into your chest. Victor is already on the decks, immersed in his seven-hour set, and we can feel the beat thudding alongside our heart. The club walls are painted black and the dancefloor is free of tables and bottles. TRADE is a place that feels like home to us, like the old, gritty New York City clubs that pumped house music with big round bass through shaking speakers. Like the memory Victor has of waiting in line outside The Funhouse all those years ago. A growing crowd fills the few open pockets that remain on the floor as everyone moves together, heads thrown back with open mouths smiling, shouting, whistling. 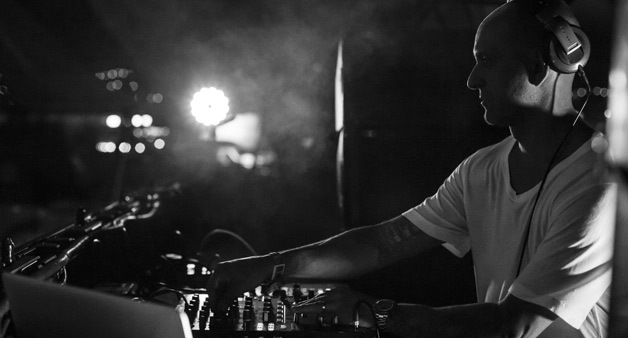 When Victor drops a dubby remix of Loco Dice’s ‘Get Comfy’ featuring UK rapper Giggs, the vibe turns into that typical New York strut, rolling ahead without regard for rules. But it is the songs off Victor’s latest threetrack EP, ‘Inside’, released on his own MATTER+ Recordings, that really get our wrists flicking and shoes shuffling – a cut called ‘Nemesis’ is particularly groovy, with dubbed-out synths, a deep, round kick and rolling snares that carry us forward into the early morning hours. As we look around the room at TRADE, pulsing with techno 20 years after Victor Calderone began a part of his journey there, it is clear that everyone here is present too, enjoying this moment in time without concern for what may come next. Because life comes full circle in the end.